The third and last book in my 2014 reading I’ll talk about is Mariette in Ecstasy, a 1991 novel written by Ron Hansen, professor, author, essayist, and R.C. deacon. Hansen is perhaps best known for The Assassination of Jesse James by the Coward Robert Ford, and his collection of essays A Stay Against Confusion is among my favorite writing on literature and religion. I’d been meaning to read his short novel for a long time, and I finally got the chance over the summer. Mariette is a 17-year-old postulant nun in an upstate New York convent in the year 1906. After she joins the community, her outward piety quickly polarizes the rest of the sisters. Her fervent devotion makes her a favorite of many older nuns, who see in her some of their own youthful zeal. At the same time, Mariette’s outward piety—and her insistence that God has communicated with her directly—turns the ire of the convent’s leaders upon her. Mariette’s spirituality is fundamentally corporal. Before entering the convent, she stands in front of a mirror, sans clothes, and dedicates her body to God. (Is she a virgin? It’s never made clear). She mortifies herself physically with practices that you might find in the The DaVinci Code. Eventually, she receives the stigmata, or so she and her supporters say; other nuns claim that it’s a cry for attention and that she’s faking. Hansen does a good job of painting a real picture of Mariette. What would a 17-year-old saint look like at the turn of the twentieth century? Mariette is full of flaws, pride, and other sins. She is suspected of being false, a phony, a deceiver, even a flirt. But, ultimately, she wants to give her entire self to Christ. Is her religious devotion genuine? Is her stigmata real? Hansen gives a definite answer as the book goes along, but I won’t give it away here. The convent, after conducting a scientific investigation into the stigmata and interviewing Mariette’s closest friends, eventually rejects her claims, and turns Mariette out while still a postulant. Tallow candles in red glass jars shudder on a high altar. White hallway and dark mahogany joists. Wide plank floors walked soft and smooth as soap. Sister Dominique says a prayer to Saint Peregrine for her Canadian nephew's cancer as she dashes flour on a kitchen table and turns over a great slab of dough that rolls as slowly as a white pig. Sister Emmanuelle hunches over a pink sewing cushion, her quick hands tying off bobbins and pins as she creates lace periwinkles for the white corporal that the holy chalice will rest on. It’s such a convincing depiction of convent life that one can’t help but wonder how Hansen had access to this kind of a world. Apparently, as we learn in an interview with Catholic writer and teacher Nick Ripatrazone, Hansen was inspired by a photographic book of St. Therese of Lisieux. His craftsmanship is matched by few other writers—the book is as tightly written and effectively descriptive as anything I’ve come across. Not a word is wasted. It’s very easy for artists nowadays, in depicting the preconciliar Church, to cast its animating spirit as stern, hierarchical, and ultimately two-dimensional. One of Hansen’s achievements in this novel is that the discipline and piety of Mariette’s order comes off as genuine, due in part to his ability to immerse us in the daily rhythms of cloistered life. At the same time, it is this disciplined tradition that rejects Mariette in the end. Near the end of the novel, Sister Mary Raphael, one of her superiors, scolds her for being “such a disruption,” as if the real issue is not the veracity of the stigmata but the fly in the soup, so to speak, of the problem it creates in the already-planned and efficient life of the religious order. 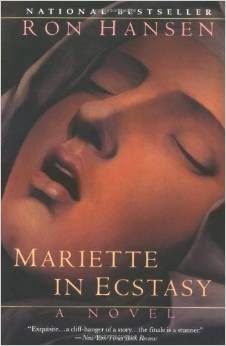 In the recent debate about the current state of American Catholic literature, one can’t read too far without encountering mention of Mariette in Ecstasy. It’s the most significant novel that directly deals with Catholic life since the days of Graham Greene. This review, unfortunately, is shorter and less thorough than Hansen’s work deserves, as I don’t have the book any longer, but wanted to get these thoughts out before 2014 is too far behind us. It’s a must-read.